Large two blade pocket knife with a Clark Sharp 440 stainless steel Hollow Ground fine edge blade and a wood handle, 4 1/8". Designed by master Cutler Dan Clark. Imprint Size:1/4" x 1 3/4", 5/16" x 2 1/8"
Ship Weight:Split or blind shipments are up to an additional $10.00 per shipping box. Price Includes: Laser engraving master for logos, no set-up charge for straight line text. No setup or per piece running charge when you select from our stock knife blade etching masters. No set-up or engraving master is required with our stock typestyles. Additional custom etching masters are required if multiple size etches are desired. Price Includes: One time fee. 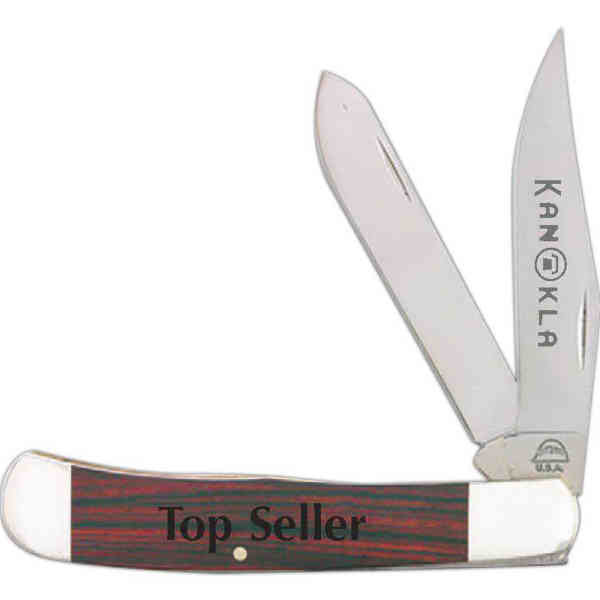 Price Includes: Each additional etch; 2nd location on same knife, 2nd blade on a multi-blade, or 2nd side of blade.